In this unit we will look at how human populations regularly import resources from outside their immediate environment, which enables them to grow beyond the boundaries set by their local resources and increases their carrying capacity. While importing resources in this way increases the carrying capacity for the local population, it has no influence on global carrying capacity. All these variables make it practically impossible to make reliable estimates of carrying capacities for human populations. The EF is a model that makes it possible to determine whether human populations are living withing carrying capacity. How useful are the systems approach and the use of models in the study of carrying capacity and ecological footprints? To what extent are solutions directed at preventing environmental impacts, limiting the extent of the environmental impacts, or restoring systems likely to be most successful in the management of pollution? How does your own value system compare with others you have encountered with regard to resource use? Can human use of resources every lead to sustainable development? How far is it possible for human society to live in balance with the biosphere>? How do models and/or a systems approach help our understanding of carrying capacity? Why are some carrying capacities larger than others? What can be done to reduce carrying capacities? How do environmental value systems influenced carrying capacities? What are your views on how best to reduce carrying capacities? How might carrying capacities change in the decades to come. Justify your answer. U 8.4.1 Carrying capacity is the maximum number of species, or "load", that can be sustainability supported by a given area. ​For a given region, carrying capacity is the maximum number of individuals of a given species that an area's resources can sustain indefinitely without significantly depleting or degrading those resources. Determining the carrying capacities for most organisms is fairly straightforward. For humans carrying capacity is much more complicated. The definition is expanded to include not degrading our cultural and social environments and not harming the physical environment in ways that would adversely affect future generations. 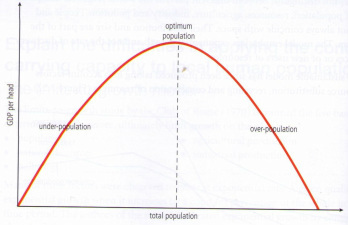 Thomas Malthus believed that thee was finite optimum population size in relation to food supply and that an increase in population above this point would lead to a decline the the standard of living, war, famine and disease. Esther Boserup believed that people have the resources to increase food production. The greatest resource is knowledge and technology. By examining carefully the requirements of a given species and the resources available, it might be possible to estimate the carrying capacity of that environment for the species. This is problematic in the case of human populations for a number of reasons. When one resource becomes limiting, humans show great ingenuity in substituting one resource for another. Resource requirements vary according to lifestyles, which differ from time to time and from population to population. Human populations also regularly import resources from outside their immediate environment, which enables them to grow beyond the boundaries set by their local resources and increases their carrying capacity. While importing resources in this way increases the carrying capacity for the local population, it has no influence on global carrying capacity. All these variables make it practically impossible to make reliable estimates of carrying capacities for human populations. U 8.4.3 EF is the area of land and water required to support a defined human population at a given standard of living. The measure of an EF takes into account the area required to provide all the resources needed by the population, and the assimilation of all wastes. Human beings have an enormous impact on the natural environment, and ultimately on each other. The way we chose to house, clothe, shelter, and meet the needs for vital resources such as food, energy, and water, not only affect the long-term availability of those resources but well-functioning Earth systems such as climate systems, hydrological cycles, nutrient cycles in the atmosphere, hydrosphere, and lithosphere, and the maintenance of a diverse biosphere. But equally significant is the fact that some of our personal and collective choices have an enormous impact on the way human beings interact in cooperative and competitive modes, including the increasingly global search for renewable and non-renewal resources and global efforts to extract benefits from distant locations and in the process limit the extent of environmental degradation. The Ecological Footprint accounts for the flows of energy and matter to and from any defined economy and converts these into the corresponding land/water area required for nature to support these flows. U 8.3.4 EF is a model used to estimate the demands that human populations place on the environment. The Environmental Footprint measures the types of products or services provided by the global hectares, for example, in terms of goods from crop lands, animal products, fish, forest products, built up areas, and energy and water use. Such analyses identify which areas are placing the greatest strains on ecosystems, and can help set policy priorities. Growth in animal products and energy use, especially of fossil fuels, are two areas that are rapidly increasing these strains. ​Non-productive land: land: us and deserts, salt marshes, etc. If everyone on Earth had the same lifestyle as the ones in the MEDCs, many Earths would be needed to support the global population. The EF is a model that provides a way round the dilemma of human carrying capacity. Instead of focusing on a given environment and trying to calculate the carrying capacity it provides, it focuses on a given population (with its current rate of resource consumption) and estimates the area of environment necessary to sustainability support that particular population. The size of this area is compared wit the area available to the population, then gives an indication of whether the population is living sustainable and within the carrying capacity provided. A house or office park with a small amount of lawn has a smaller ecological footprint than a house or office park with acres of lawn treated weekly with chemicals and water. When we look at the footprint of the average person in a MEDC, it is clear that we would exceed the carrying capacity of the earth if in the future, other populations adopted this average lifestyle. Even with the current world population count it is clear that patterns of consumption in MEDCs are not sustainable, and projected future populations make it dramatically less so. 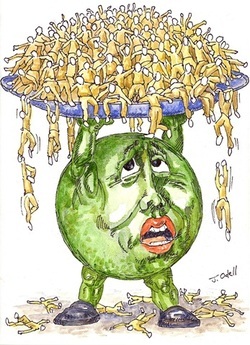 U 8.4.7 If human populations do not live sustainable, they will exceed carrying capacity and risk collapse. ​One of the consequences of this explosive growth in human numbers is that human demands have outrun the carrying capacity of the economy’s natural support systems — its forests, fisheries, grasslands, aquifers, and soils. Once demand exceeds the sustainable yield of these natural systems, additional demand can only be satisfied by consuming the resource base itself. We call this overcutting, overfishing, overgrazing, overpumping, and overplowing. It is these overages that are undermining our global civilization. 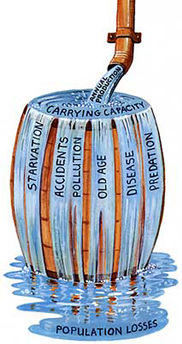 Applying the concept of carrying capacity to local human populations can be very difficult. By examining carefully the requirements of a given species and the resources available, it might be possible to estimate the carrying capacity of that environment for the species. This is problematic in the case of human populations for a number of reasons. The range of resources used by humans is usually much greater than for any other species. Furthermore, when one resource becomes limiting, humans show great ingenuity in substituting one resource for another. Resource requirements vary according to lifestyles, which differ from time to time and from population to population. Technological developments give rise to continual changes in the resources required and available for consumption. ​Data for food consumption are often given in grain equivalents, so that a population with a meat‑rich diet would tend to consume a higher grain equivalent than a population that feeds directly on grain. Be aware that in MEDCs, about twice as much energy in the diet is provided by animal products than in LEDCs. Grain production will be higher with intensive farming strategies. Populations more dependent on fossil fuels will have higher CO2 emissions. Fixation of CO2 is clearly dependent on climatic region and vegetation type. These and other factors will often explain the differences in the ecological footprints of populations in LEDCs and MEDCs. LEDCs have small ecological footprints as MEDCs have much greater rates of resource consumption. This is partly because MEDCs have higher incomes and the demands for energy resources is high. MEDCs consume a lot of resources as they are wasteful, they also have more waste and pollution. LEDCs are the opposite with lower consumption as people do not have too much to spend. The economy of the country forces them to recycle many resources, however they are developing and they’re ecological footprint is increasing. Canada (5.4 ha/person) – low productivity from trees as located in high latitudes, large distances to cover by car, wealthy population, heating needed in cold winters and electricity in winter for dark evenings. Peru (0.9ha/person) – fast growing trees (high NPP), largely vegetarian diet, low car ownership, warm all year round, poor population. Individuals in LEDCs have not only had a historically low consumption of non-renewable resources, but have also adapted environmental value systems that have encouraged working in balance with nature. Human carrying capacity is difficult to quantify and contains elements of subjective judgment. it has been claimed that historians cannot be unbiased-could the same be said of environmental scientists when making knowledge claims. When the global population reaches 9 billion people, how will the Earth cope? The population of the world is growing faster now than at any other time in history. The UN projects that it will double in 60 years. Any other animal community that grows at an unprecedented rate will crash spectacularly when it exceeds the `carrying capacity' of its environment. What is the carrying capacity of this planet we call Earth? The question is much like asking how many guests your house can comfortably hold and support, or how many people will fit in your car and transport everyone safely on a long journey? This documentary is about the importance of recycling and changing our habits to preserve our planet.